They prefer to rest on the leaves of certain small oak shrubs. It took me some years to condition my eyes to spot them. The critical cue is the geometry of their wing profile contrasted with their nongeometric surroundings. Our subject here is nectaring on a native wildflower whose name is wingstem. Wingstem is a shrub that grows to a height of 6-7 feet and produces hundreds of bright yellow flowers that seemingly pump nectar. 2011 saw abundant wing stem. In 2010 wing stem was less evident. Hairstreaks,like most gems, are very small, but very beautiful. There are many species about: Striped Hairstreaks, Banded Hairstreaks, White M Hairstreaks, Oak Hairstreaks, Acadian Hairstreaks the list goes on and on. This is just to serve as a reminder that if you ever think you know everything there is to know well, there’s those Hairstreaks! 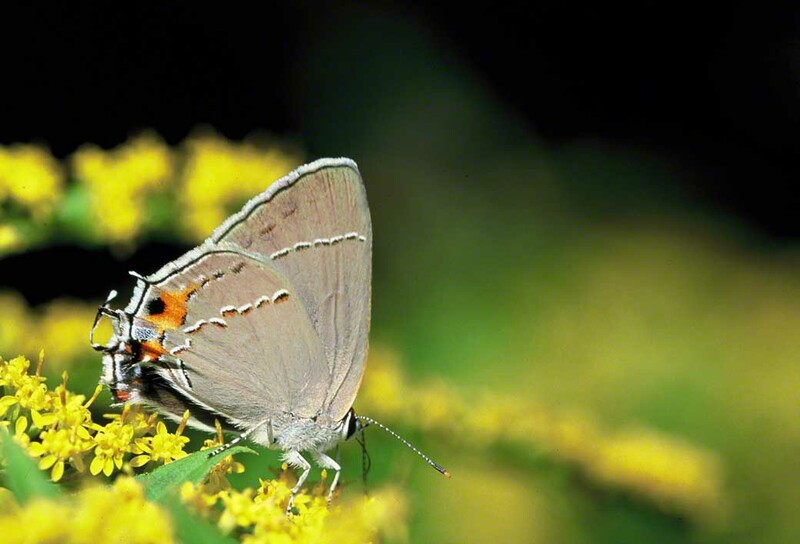 What 5 colors are on display on this Gray Hairstreak? Gray, black, white, orange…and is that a little bit of blue near the wing tips?